The partnership is through Kinetic’s startup incubator, KineticX, which is focused on technologies shaping the future of Out-Of-Home advertising. Voyager is a full-motion platform designed for cinematic VR experiences. 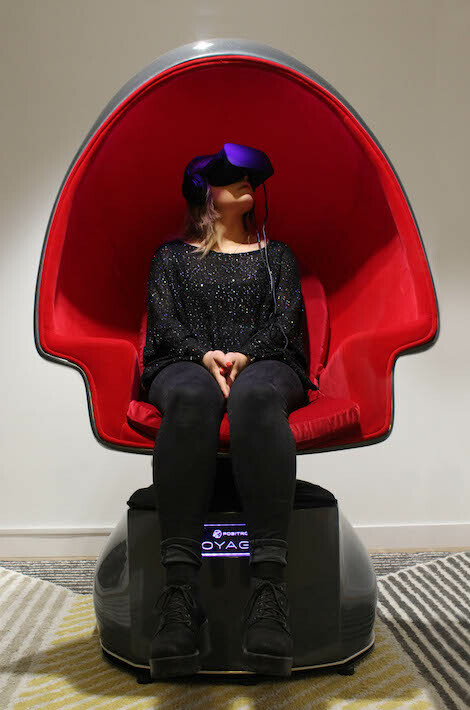 The specialised chair incorporates physical nudges, including haptic feedback, motion and scent, which layer for a truly immersive user experience. Created by US-based VR technology studio Positron, the platform recently worked with Universal Pictures to support the 2017 release of The Mummy at this year’s #SXSW festival. KineticX was launched in February 2017 in response to the increasing rate of technological advancements impacting the location and out-of-home advertising market. The programme actively shapes how brands connect with audiences on the move while offering brands innovative solutions and providing early-stage businesses with access to Kinetic’s broad client base. This entry was posted on Tuesday, September 5th, 2017 at 06:50 @327 and is filed under DailyDOOH Update. You can follow any responses to this entry through the RSS 2.0 feed. You can leave a response, or trackback from your own site.